The are a range of great featurea, but the most prominent one is the simple extra row on top of the keyboard that gives you characters commonly used in programming. HUGE timesaver! as shown in the image below, you can work with multiple files… all in all I am extremely impressed. Many thanks to the friends on Twitter who suggested it! 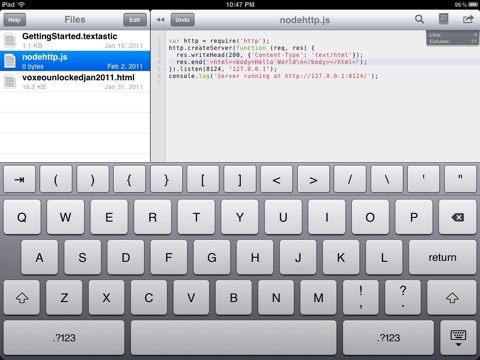 This entry was posted in Programming and tagged code, editors, iPad on February 3, 2011 by Dan York. This server has received 5727035 hits from both ipv4 and ipv6.